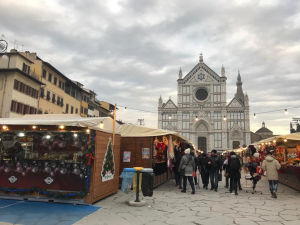 We caught up with Florence Assistant Program Coordinator Elizabeth, who highlights why you should choose Florence as a study abroad host city during the fall semester. There are many things to consider when choosing to study abroad so I’ve decided to shine light on some often overlooked things for you to consider before coming abroad. Drum roll… Let’s talk about seasons! Have you thought about which season you would like to experience abroad? I’m not going to lie, Florence is beautiful ALL year round, however, if I had to have my pick, I would choose fall as my favorite season in the city! 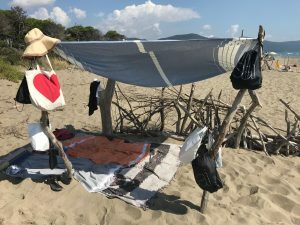 Which is why I’m taking this opportunity to list six reasons why you should choose to study abroad during the fall semester in Florence (with a HUGE bias, due to my aforementioned love for fall in Florence). View from San Gimignano a walled hill town one hour away from Florence! 1) Great weather! During fall semester, you get to experience the last of summer in Italy, which can last until the final weekend of September. Starting in October, we get some sunny afternoons with a nice relief from the heat during the night. In November and December, the weather starts to cool off, but let’s be honest – there’s no better way of beating the cold than with a nice cioccolata calda (hot cocoa) and an Italian pastry! 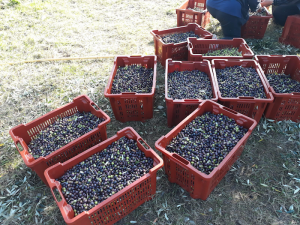 Hard work pays off, those olives will make delicious olio nuovo! 2) As fall season starts in Florence, you get to experience two of the most ancient traditions in Tuscany, grape harvesting and olive picking. 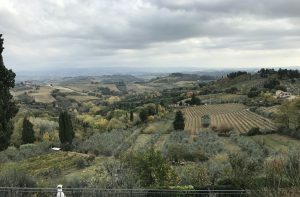 If you take a road trip through the Tuscan hills, you’ll not only get to take in scenery that seems straight out of a movie, but you’ll be able to see Tuscans harvesting their fields and you might even get to enjoy their newly made products first-hand! This is the perfect moment to try olio nuovo or “new oil.” Believe me, once you try it, you’ll never go back! 3) Sagre! Sagre! Sagre!. Another great thing about fall in Florence is all of the “sagre” going around in Italy. A sagra is a rural festival held in the open air and is usually based around one or more culinary specialties, Italians hold feasts for almost anything during this period. You love gnocchi? There’s a feast for that. Love chestnuts? There’s a feast for that too! So join in the festivities to celebrate food and explore around Italy by trying every single thing there’s to try! 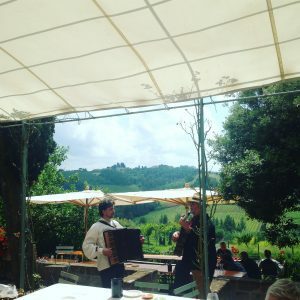 Sagre usually include traditional music, like this one near San Miniato! 4) Tourist Low Season – European cities are generally very crowded with tourist, however, this is not permanent. At the beginning of November, tourist season starts winding down and we finally get some relief in the city. Many museum prices lower with the start of tourist low season on November 1st, lines start winding down, and you’re finally able to visit everything you want without fighting the crowds! 5) Food! Let’s start with pumpkin. If you like your Pumpkin Spice Latte, you will definitely like how Italians use it on everything they can. You want tortellini or maybe some risotto alla zucca? You got it! But pumpkin is not the only thing! If you enjoy fall flavors, you’ll enjoy them even more with an Italian flair. You will also be able to take advantage of a lot of different types of food that are in season. You may want to try persimmons, uva fragolina (grapes that taste like strawberries, I KNOW!) and truffle! 6) Tis the season! Christmas is a big holiday in Italy. 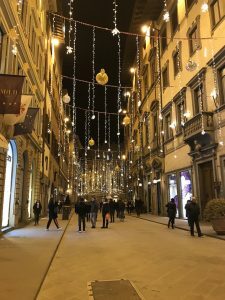 It is common in Italy, and especially in Florence, for each neighborhood to put up Christmas lights. The further you go into the city, the more jolly and different the lights are! Some neighborhoods, like San Frediano, display lights to follow a theme; last year being musical instruments. You will also be able to enjoy the traditional German Christmas market in Piazza Santa Croce! As you can see, fall semester in Florence has a lot to offer! There’s something for everyone and the same thing goes for all around Europe! If you’re already planning on coming in fall and need suggestions on how to reach different sagre, or places to try new oil or truffle feel free to reach out to any of us in the Florence office and we’ll be happy to help you plan accordingly.